A big thank you as always to Michael for the up keep of this great site. Now I have a passion for pretty much all 1/6th figures, be they hyper realistic or super stylized. However I also have to admit that over 98.3% of the figures I own definitely fall into that earlier category being more ‘representational’ rather than ‘ abstract or avant-garde’, but as I get older I do find myself drawn to more and more leftfield interpretations. 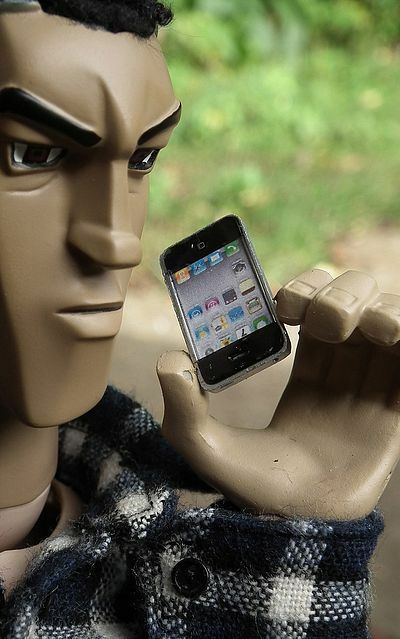 And lets face it, can you truly get more post-modern than toys designed for adults… I think not! 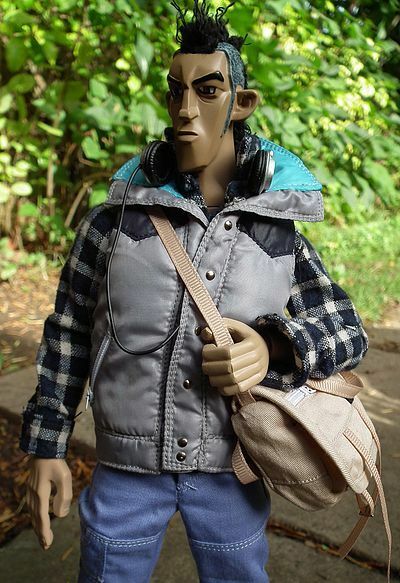 One of my top figures from recent years has to be the über cool ‘Space Adam’ that I reviewed a couple of years back. He carried no license or IP other than the one Winson Ma had created for him, and that frees up a designer to get far more imaginative in the directions that they choose to take their creations. 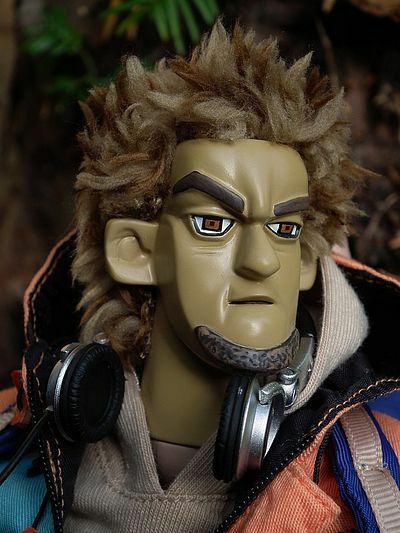 It also means that the work of artists like say Michael Lau, Eric So or indeed more latterly Ashley Wood (though there are countless others) enter a special place in a world where manufacturing and toy design crashes head long into pop cultural art. The styling tends to be more urban, unusual, challenging or down right weird, it often means a more eclectic collector will be drawn to what’s on offer. And it has to be said that these people have tended in the past to be more selective and discerning in what they will or wont buy, liking the exclusivity of a designer name coupled with lower edition sizes and reassuringly high prices (to keep the riff-raff out). In short, it could be said they were pop-cultural snobs! But the funny thing is, that as in fine art, literature, fashion, music, movie making and dining, it is always the artists who push the boundaries of what others find to be acceptable that makes things move forward. And a little over ten years ago Jason Siu was among a group of young designers that wanted to stamp their mark on the world. There were other high profile names… well, high profile if you moved in the right circles, those circles being the high-end urban fashion labels and vinyl toy collectors of the mid 90’s through to the mid noughties (BAPE, Stussy, SSUR, Maharishi anyone?). They became infamous for ridiculously detailed production values, obscenely low edition sizes and prices that made the eyes water. To be a serious collector you basically needed to be a young upwardly mobile individual with a healthy disposable income and a taste for the achingly cool. You were the kid that desired things that said something about who you were, what tribe you belonged and had to instantly influence how you would be perceived by your peers! Thanks for taking time out to answer a few questions for our readers at Captain Toy. JP- Amongst collectors of Urban figures you are most infamous for your Gangster Paradise and Monkey Playground 1/6th figures and the Soundspeaker vinyl collections, but can I ask you to give our readers a quick potted history of how you got into the toy-designing scene, your background and influences. before I got into toy industry. 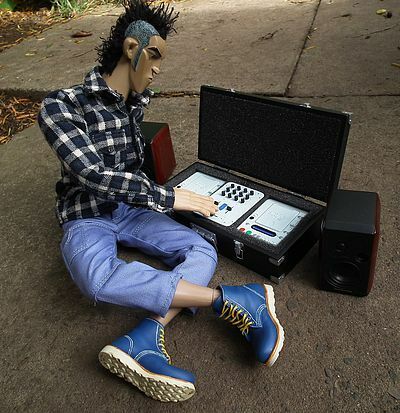 JP- Were any particular artists designers or musicians inspirational in making you want to create vinyl and 1/6th figures? JS- I coming up with idea with music go along with me, trap hop, Massive Attack, Portishead…..
JP- How does your design process work, what are your methods? draft the initial layout to portray my idea more realistically. But occasionally, like speaker series, I come across the novelty that makes me reverse & subvert the process. JP- Where is home for you, and do you work from a studio/workshop space. JS- In Hong Kong. I work at my studio in industrial district. JP- I have to ask how your collaboration with ACI came about. JS- I met Brian of ACI, at a design festival 2012 where I exhibited my works in a showcase. Soon after, I proposed the idea “Primates” to him. JP- Can you tell us a little about the process on Ray and Brad specifically, how they progressed in going from your initial sketches through to the finished figures from ACI. JS- Most recent years, I realize there are many contradictions and people on strike in the street like “Occupy Wall Street”. So I was inspired by those “Camping Protestors” who are conflicting against the injustice. In the procedures of manufacture. Firstly, I got my main theme for the figures, “ The primate in concrete Jungle” and then I create my illustrations & painting, finally I make 2D & 3D sketches for the characters I created. I made 3D clay models & follow the process of figure production. JP- I often wonder if people truly grasp just how many disciplines original 1/6th figure design encompasses. Most obviously you are developing character design, but you also take in product design for the accessories and fashion design for clothing. I take it you also designed the boxes for these, so you did the illustration and typography as well. Do you harbour desires to do more product or fashion design outside of the toy industry? JS- Yes, I think creativity can be applied to different industry. JP- Is there any one aspect you enjoy the most? I was talking to Winson Ma recently and he said he still gets a big kick out of designing the accessories! JS- Every aspect, they do different crucial role. JP- With the rapid growth and constantly improving quality of 3D printing (that can also be colour printed on output), do you see it revolutionizing the designer toy industry? I can see a future where figures are purchased and downloaded directly. JS- In my opinion, our designer toys work as a tool to portray the unique ideas and skills to our audience. Our collectors will prefer the real figures which bring our message and quality to them. JP- That last question also opens up a whole can of worms regarding intellectual property and illegal copying. Have you had any issues in the past with this? JS- Yes, I have experience with someone produce the similar speaker as my design, but without the concept & quality. JP- What are your feelings when you first unveil your new creations, like any artist I would imagine there are feelings of pride but also trepidation. When you show off your new baby for the first time you must wonder how the public will react. JS- When the new figures were launched, I was ecstatic and excited, because that’s the main motivation for my creative life. JP- Do you read online reaction to your designs, the internet can be a loving and cruel mistress in equal measure? JS- I just ignore the malice, only concern with good advise. 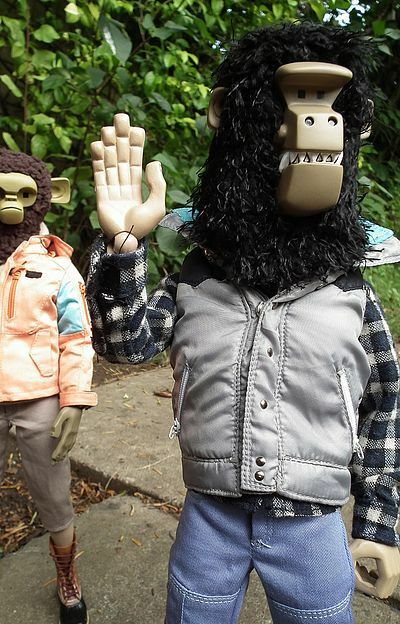 JP- Can you share any future plans you have, I know Ray and Brad are intended as the first releases for the ‘Primates in Concrete Jungle’ series, what might follow, and can you tell us a little more about the V-People line that has been revealed at some shows? JS- V-people is ACI’s ideas which they want to achieve the Pop culture market but Special. JP- I take it the V-People line has taken some inspiration from the 70’s group Village People (the Native American was a giveaway), but were Ray and Brad’s names inspired by Ray Bradbury at all, geeky question I know, but I had to ask as I think it every time I write their names? JS- Not exactly, they are only named from familiar neighbor. JP- Thanks for your time, it is much appreciated. Finally, do you have any tips for any people out there that want to get into the toy design business? JS- My tips for people who want to get into toy design business is only to attempt if you have conviction, and only after you are well prepared. I truly love these boxes, they have a charming and quite authentic 70’s vibe going on. The designs were also by Siu and showcase his prodigious talents also cross over into illustration and very tasteful typography. The main body of the boxes are identical, showing an expansive illustration done in a montage style. I think I could just about pick Ray and Brad out from the crowd, but this is intended to set the scene for the flavour of the series, rather than directly referencing the figures within. The matte quality of the stock used, coupled with the slightly faded colour palette used manage to give them a genuine vintage feel, and the retro typography transports me back to flicking through school library shelves in the 70’s. The actual construction is a variation on the classic 5 panel, flap fronted box, but with an extra magnetic flap holding the right side shut. Just lift this and unwind it to the left and you will see the fully dressed figures laid out in transparent vac formed plastic trays. Everything here is collector friendly, and as long as you handle with care you should be able to replace them with no one knowing. The rear of the box also has a full production credits list, with contact details for both Jason and ACI. 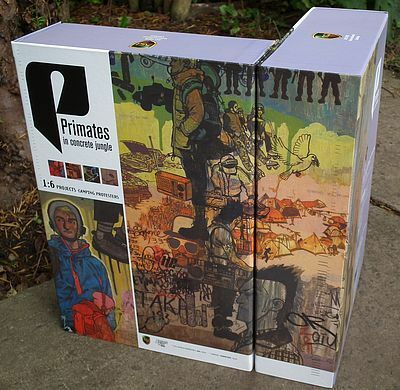 Theses are intended to be the first releases from the ‘Primates’ series, so I would imagine they will get plenty of reuses as the line is fleshed out, and its also worthy of note that there is a sticker on the side panel with a silhouette and name of the character within. Plus there is the special bonus of each set coming with Jason’s hand signed signature on one of the boxes in the set, on mine it was Ray that was autographed in silver sharpie. I‘ve said before that when you are in the realm of stylised figures it is virtually impossible to judge quality in terms of interpretation; all you can do is bring personal taste to the table and also comment on the quality of finish achieved by the manufacturer. Luckily these appeal to me greatly! 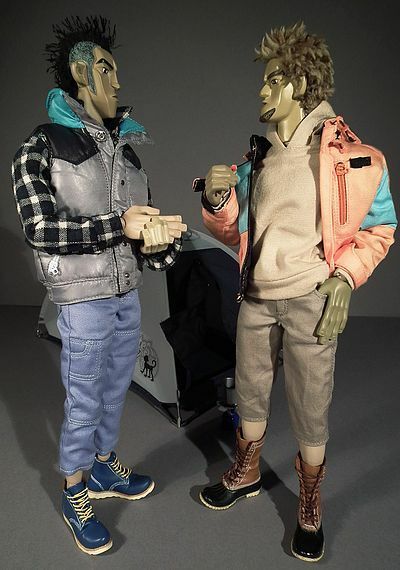 Both figures showcase Jason’s trademark style, but also come from a place where they could be displayed alongside classic urban figures from the past. Though both are very stylised they also exhibit a lot of personality, and have individual distinct looks. Brad takes on the mantle of the slightly more laid-back dude of the two. They are billed as camping protestors, so are obviously meant to embody a liberal sensibility coupled with a militant attitude, which they manage with ease. 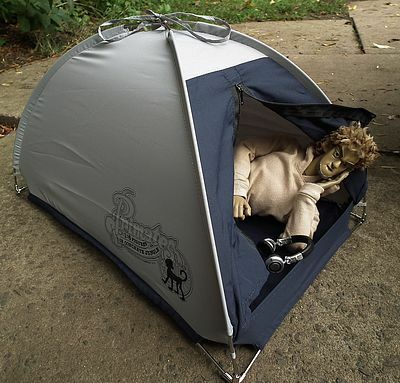 And lets face it, we all know camping is intense! As I said, Brad does look like the slightly more hippyish guy of the pair, with his shaggy surf dude hair and goatee. That’s not to say Ray looks like a bad guy, but his sharper features, steelier eyes and Mohawk hairstyle make him look a little edgier! Both have angular chiselled features and I’d find it hard to pick a favourite out of the two, but if push came to shave I think Brad just has the edge. He has a determined expression with his mouth displaying just a hint of a smirk and his right eyebrow cocked inquisitively. His goatee just covers the bottom half of his chin, as goatees are apt to do, lets face it, if it went any further he’d have a full Abe Lincoln! Both Brad and Ray have large protruding ears, but Brads are less noticeable because of his unruly mop of hair. The hair itself is made of soft ‘tufted’ fake fur, and gives the convincing effect of someone who wants to appear not to care too much about their appearance, whilst secretly spending ages on it, and caring very much! Ray has a much leaner look, with long features that are emphasised because of his lack of facial hair, longer nose and shaved sides of his head. His expression is equally as serious as Brad’s, and his hairstyle makes his ears appear even more dominant. 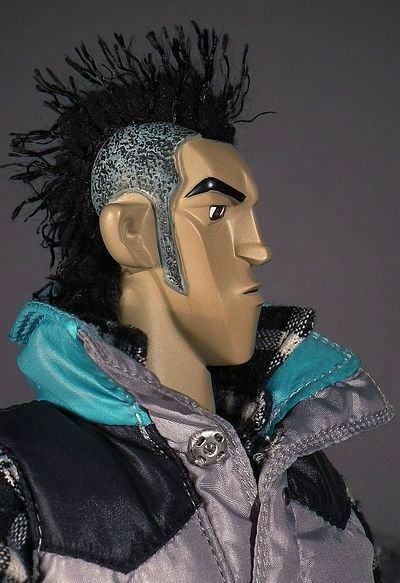 He also sports some real hair, however its made of a different material and is just in a strip from his brow to the back of his head in the classic Mohawk style (I wont go into the history of the style now, but I did go over it in a review once before, so if you are the kind of pedant who wants to correct my misuse of the name go read this- Ricky Foster review. You’ll find that both figures hair will need some gentle futzing when you take them from the box, and make sure you are gentle as if you are too rough you could risk pulling it out. It’s by no means weak, but just be cautious. 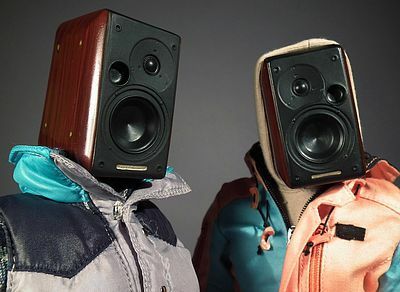 The extra speaker heads are virtually identical with the details on the front being a mirror image of each other, all the detailing is crisp and well defined, their inclusion being cool as a Jason Siu trademark (check out his vinyl Soundspeaker figures) and also handy to sit either side of the CD case when not fixed to their shoulders. Next up are the ape heads which are also super stylised, with extreme geometric angular features which are softened by the use of real fur on the ‘hairy’ parts. I like them, but I prefer the human heads so mine will be staying in the box, or perhaps displayed separately. Something I will mention here is just how sweat inducing the swapping over of the heads was. 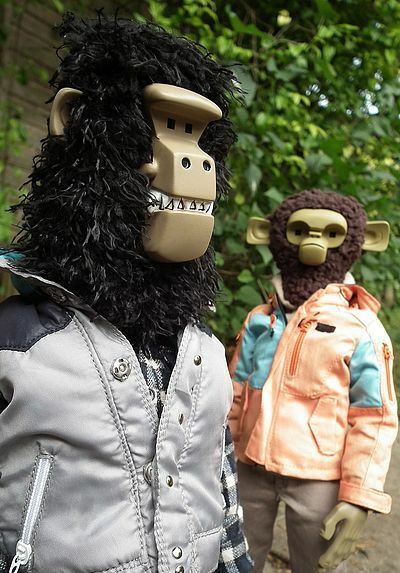 You will find that you need to apply a lot of heat to make the vinyl of the neck soft enough to swap over, in fact I found it so nerve wracking that I only did one (Brad from human to ape), all the other pics I took to show the alternate heads were done using a blob of Blu-Tack. The simple inclusion of neck posts attached to the ape heads, and a couple of extra for the speakers could have solved this problem and I hope they consider this for future releases. They also come with two sets of hands each, one pair gripping and one pair flat. These are the same sculpts for both figures and the exaggerated angular style has quite a cubist feel to it. They are also intentionally oversized, and the general design and sculpting is executed beautifully. My only wish would have been for a few more different poses, but more on that in accessories. In short, from a sculpting angle there is virtually nothing that I can find to complain about, so if you are a fan of this kind of figure, and the price doesn’t make you baulk, I can highly recommend! When looking at stylised figures, from the massed ranks of the ThreeA ‘human’ figures, through to the classic Brother Workers and indeed Sui’s own Gangster Paradise collections, you will realise that hyper-realism is not the order of the day here! To enhance the extreme features a simpler palette is utilised, but what is demanded is a super crisp application that is so perfect it looks almost like you are looking at a 3D illustration made real! For the uninitiated, imagine if you will Jamie Hewlett’s Tank Girl or Gorillaz in a solid 1/6th form! So I’m pleased to report that most of the paint app here is very precise, but there are just a few issues that keep it from perfection. The human heads are very strong, with nice clean work on the eyes and eyebrows, and indeed the mouths are relatively crisp and precise. Likewise the speaker heads (which are mirror imaged identical sculpts) have some great work on the wood grain effect. However I did find that the ape or ‘Primate’ heads were just a little less accurate… certainly not sloppy, but lacking the clarity of precision one expects. Nothing truly bad, but at the price-point these two are at, one does expect a higher degree of flawlessness! The other thing that drops Brad’s score an extra half star is the fact his hands are a much darker skin tone than Ray’s. 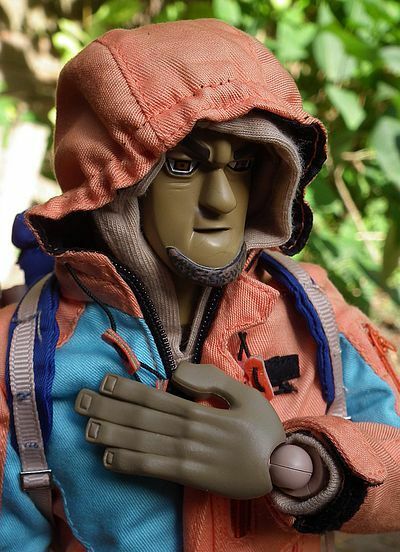 Not only is this marginally darker than this face, but it is way darker than the base plastic used to construct his body, so you’ll have to keep the sleeves on his hoodie and jacket pulled down to hide the transition line. And likewise it means where his shins are on show between the boots and his flood pants is visibly too light compared to the rest of his colouration (unless of course Jason intended him to be Brit, in which case this is not an unusual look, you’ll often see us on holiday abroad with a tanned face and arms, but fish-belly white legs and body… it’s the English way!). These guys come on ACI’s stock 1/6th body which has a great range of mobility, its basically everything you want from a modern body and has what is credited as 30 points of articulation. This means it basically offers pretty much all the poseability of a TT and was more than up to the job here! I just wish the heads had been easier to swap! These guys come with a great selection of extras; firstly there is the dome tent that comes bagged up in a drawstring sack. Its made of what appears to be real nylon tent fabric and has a metal frame that needs to be threaded through the seams, putting it together was a doddle and it actually makes for quite a cool little display item. 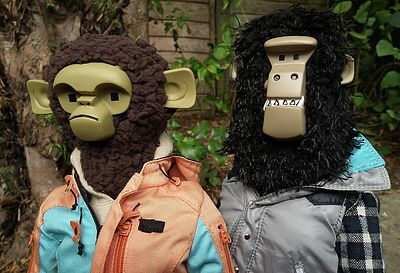 It has a working zipper up the front, stitched ribbons on top for tying to the frame and a Primates in Concrete Jungle logo printed on both the side panels. So all in all we get a pretty sweet and well-detailed selection. Could it be improved upon, well of course, the CD players could open and have tiny insertable disks, and it the tape deck had been able to flip open and had a miniature cassette inside I’d have been over the moon. However, they would perhaps have overcomplicated things and may have made things even more expensive, not to mention horrendously fragile! 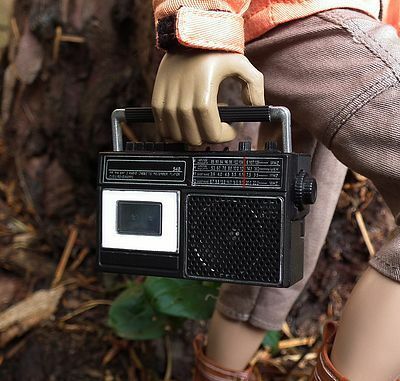 As it is the radio does have a hinged handle and the aerial can flip up to an upright position (but at this scale is obviously not telescopic). 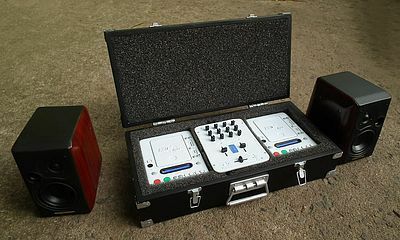 And the twin CD’s and mixer do come in a foam surround case that like the smaller silver case can open and shut with working hinges and miniscule working clasps/latches. They also come with bags; Rays being a satchel/holdall design with a padded adjustable carry strap and small working pockets that have tiny functioning zips and buckles. 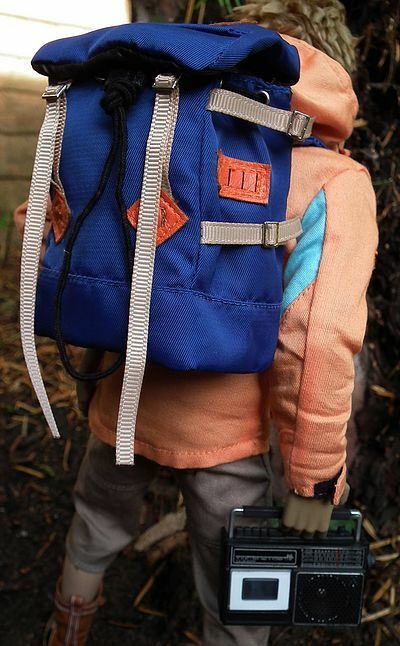 Brad has a larger Bergen, but again it has working zips, straps and drawstrings. Being groovers on manoeuvres they keep abreast of the latest happenings with twin smartphones, but then manage to drag things back a few years by having a more retro vibe with some classic old-skool cans. No Beats by Dre here! 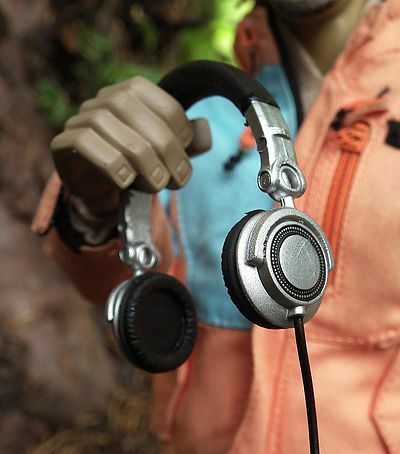 The headphones are made of a softish vinyl that gives the right texture for the leather parts and has working hinges on the speakers and there is also a length of flex that has wire in it to aid in the posing. So a cool little haul, and if I had to pick out my favourite items it would have to be the retro transistor radio and tape player, with the tent coming in a close second! The attention to detail here is pretty darned impressive, and the quality of tailoring is excellent throughout… so why no full score for Ray? Well, it’s only just short of a full score, and the reasoning is the thick fabric used on his shirt that does end up looking a tad bulky. Funnily enough I can remember having a heavy Stussy checked shirts back in the 90’s that was made of such thick woven cotton that it was as warm as a sweater, so maybe its intentional and that is the look they are going for here. But even so, the scaled fabric would still feel too thick on this occasion. As I said, the shirt does seem a little bit thick, most noticeably at the collar and cuffs, but the overall cut and finish are still excellent. It has metal studs up the front and Velcro tabs on the cuffs, but tiny buttons are sewn on the front, cuffs and onto the flaps of the patch pockets to help in the look of its scaling. The blue trousers have a mid calf length and have working pockets throughout, nicely executed but a relatively straightforward garment. His gilet however is a far more complex item. Its made up of panels of sky band dark blue with a main body of light grey. It has metal studs concealed to fasten the front with tiny studs glued on the front panel to mimic scaled fasteners, and miniscule working zips on the pockets. His boots are made of moulded plastic, but have super fine detailing on the paint applied to the soles and stitching, plus they have real laces threaded through the eyelets to add to the realism. The standout garment in Brad’s ensemble is the jacket, it’s not of a style I would ever choose to wear, being of the ‘outward bound’ hiking and orienteering type of thing (not my bag). However, the detailing is quite excellent. 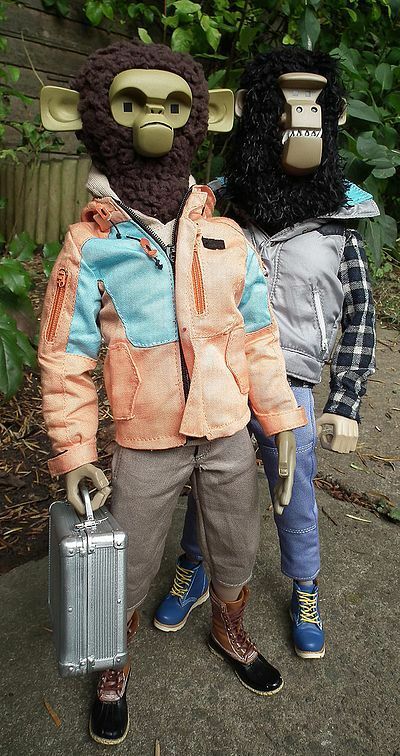 Like Ray’s gilet it has working pockets and similarly utilises super tiny scaled zippers, it also has adjustable Velcro cuff tabs and small working pull cords around the neck and hood. Under this he wears a straightforward hooded top, simple and classic in its design but again fabricated beautifully. It might have been cool to include a design/print on its front, but it certainly doesn’t suffer for its omission. He also wears short trousers that go just below the knee, but have a simpler design than Ray’s. 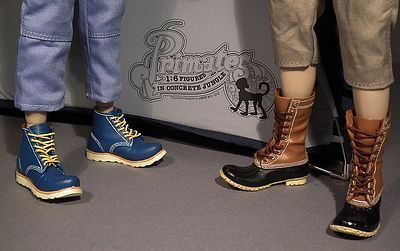 I’m very fond of his boot design, but I’m biased as I have a pair very similar, as the main body has a ribbed toe like a pair of galoshes but with a tan leather collar, these are also made of moulded vinyl and have working laces like Ray’s. That is pretty much it in its essence, and apart from the fabric on Ray’s shirt being a trifle thick I have no issues at all, just two beautifully put together 1/6th civilian outfits! These are definitely a duo of fun toys, and they pose like a dream, but they are also very much adult fare. This fact is evident of course both in concept, (anti-establishment protestors, hinting at a healthy level of civil disobedience ‘fight the power!’) and also because of their price bracket which will keep well out of the reach of those operating on a pocket money basis! These are meant to be purchased and then displayed knowingly in a cabinet or on a shelf (perhaps whilst gently stroking your chin) and admiring their post-modern sensibilities. 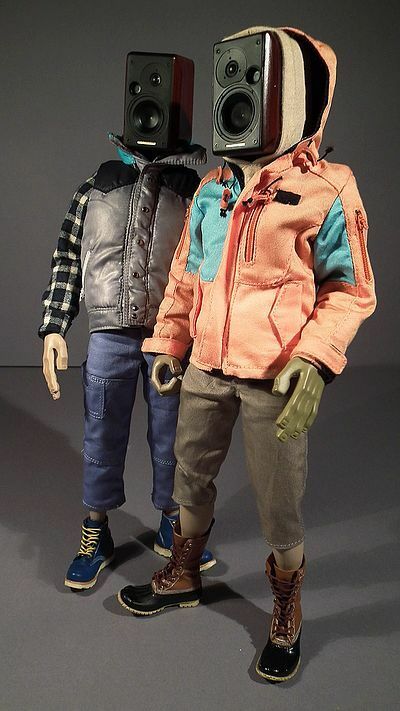 Of course you should also get a kick out of their real world play value, they are after all two very cool and poseable dolls… but not being soldiers, superheroes or aliens they will only appeal to a niche market. If you happen to be one of those within the target demographic, I know in my heart you will see a ton of fun in these… and you certainly won’t be one of those chin strokers… you’ll be like me, a big kid who just loves toys in their purest form… toys for toys sake, that just happen to be designed for us not so grown-ups! In real terms these do not represent a great deal and will certainly never be looked upon as a bargain, with an asking price of $550 for the pair they are way more expensive than many of Hot Toys top of the range fully licensed products. However that would be far from a fair comparison. These are aimed at a totally different audience, one less concerned with the latest figures from a Hollywood blockbuster or video game, but more interested in the unique vision of a named artist. It is also more than worthy of note that these have an edition size of just 250 sets worldwide, and one box from each set (Ray on mine) is hand signed by their creator. I guess for those that like the ‘security’ of a numbered certificate, it might have been a cool thing to include, and would have afforded Siu the opportunity to include some sketch work and images of the design process. However that is not the case, we don’t get a certificate, but we do get that signature on the box, and when you look at the fact there only 250 of each character on this planet, it drives home what an insanely small edition size that is! I can honestly say I’d rather an edition size of 500 split the difference and make them $400 a set, but in real terms price is not an issue here as they sold out to their intended buyers within days of going on sale. 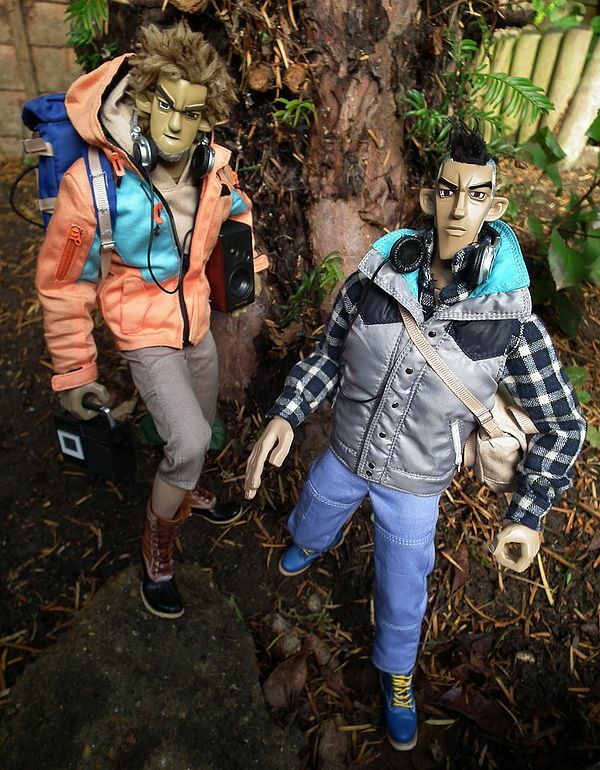 Of course that means you’ll now be lucky to find a set for under $600, and that price is bound to rise as more Jason Siu fans who missed the original release become aware of them and scramble to get hold of a set! Hence my score is based on that of an average punter. If you are more of a designer toy aficionado you might just consider the price something of a bargain… especially if you read this review from the archive in a year or so from now! These guys are well articulated, well dressed and come with a solid haul of goodies. They also arrive with a selection of three heads each (not bad by anyone’s standards) and the build quality is excellent. However with a breakdown cost of $275 each (if you chuck in half a tent per character, or just look upon it as a bonus as it is packed separately) they are to us regular collectors in a price bracket that could seem pretty excessive. But even though I am in danger of sounding like a broken record, the collectors of mass appeal licence lead fan-boy favourites are not the crowd these are designed to please. And the fact they sold out in the blink of an eye says they pleased their intended audience greatly. Add to that the fact that I could only find two sets available on the secondary market, it would lead one to hope that the small quantity available has ended up in the hands of the true Jason Siu collectors, rather than the traders and scalpers! As such I felt tempted to give these a full score, but hey, I need to keep it real, so taking into account the few small niggles I had with the paint and remembering that $550 is a whole heap of wonga, I have kept these just short of an elusive full score. But if you are the kind of collector who has a room with cabinets and shelves display the art of the likes of Brothers Worker, Michael Lau, Eric So and others, then these two will probably be getting a full score and a whole heap of respect! At the time of writing ACI had sold out of sets available direct from them, but you can still view the spec and see the official photos here. However some were still available on eBay. 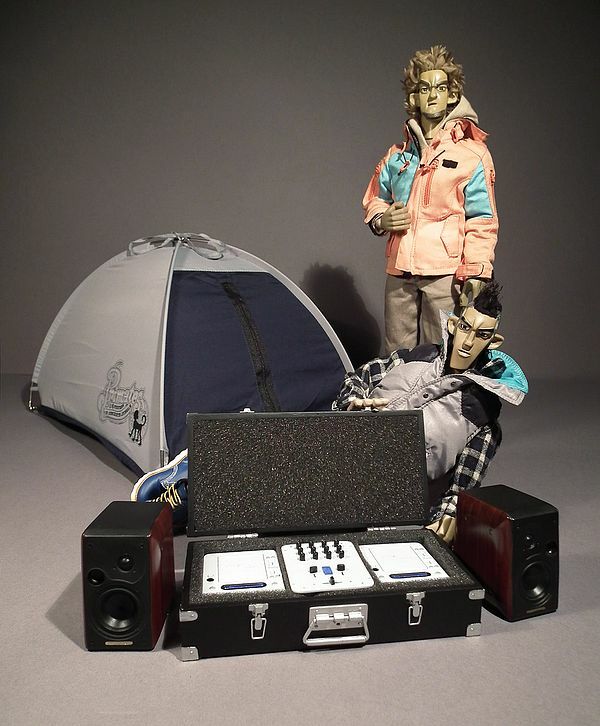 There was a set without the tent included for $600 or you could purchase Ray on his own for $328 and Brad for $318. Good luck!